Nothing encapsulates the quality of Italian beef cattle like the Fiorentina. Taking its name from the city of Florence, this cut is the English or American equivalent of a T-bone and such is its size that many an over-confident visitor from abroad has gasped at the slab of meat placed before them in one of the city's many restaurants. Sourcing the finest local ingredients is an essential constituent of all the best Italian dishes, and the Fiorentina is no exception. It is the product of one of the Chianina herds that roam the fields of Tuscany. Down the ages the breed has been immortalised in the words of poets and the works of Roman sculptors. What the diner will experience is a meat of great flavour and texture. A Fiorentina is best sampled in a Tuscan eaterie although they can be found on menus in many parts of northern Italy. Replicating the experience in a domestic kitchen involves buying the best T bone available and cooking it medium rare. Ensure that no salt is added to the meat prior to or during the cooking process as this will only serve to draw out the juices, making the flesh shrink. Rather, season when the meat comes out of the pan and serve with a simple green salad coupled with a dressing of oil and lemon juice which will cut through the fat content on the palate. There are many variations on braised beef to be found in Italy, the meat given a number of hours to tenderise in the company of a good bottle of the local red wine. Piedmont is blessed with some of the country's finest mushrooms, and many a dark autumnal night can be enjoyed combining them with beef bathed in Barolo and served with slices of Polenta. Ground beef finds its way in to many pasta sauces, most notably Bologna's ragu, which works equally well with tagliatelle as well as forming part of a deep dish of lasagne or cannelloni. For those looking for a more refined approach to the art of preparing beef, it is worth attempting a carpaccio. Created in the 1950s by the owner of the world famous Harry's Bar in Venice, Giuseppe Cipriani, it is named in honour of the Venetian renaissance artist Vittore Carpaccio. The meat is eaten raw, so it is important that the best quality fillet is secured. Simply cut very thinly across the grain, flatten and tenderise the slices gently with a kitchen mallet, cover in plastic film and refrigerate for 30 minutes. To prepare the dressing: take 200g of mayonnaise and add two teaspoons of Worcestershire sauce, a teaspoon of lemon juice and two tablespoons milk. Whisk the mixture and season to taste. Take the slices of beef out of the fridge, arrange them, overlapping, on a plate and drizzle the dressing over them. 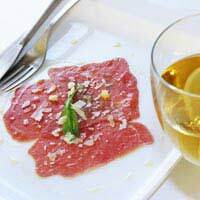 Some versions are accompanied by rocket leaves and even shavings of parmigiano reggiano, but at its best carpaccio lets the meat and dressing do all the talking.